Millions of people have watched the weekly "Star Gazer" program since its inception in the 1970s. The show helped popularize naked-eye astronomy by offering advice on what to look for in the night sky. Jack Horkheimer was born in 1938 to a wealthy family in Randolph, Wisconsin, the son of Mary Edmunda Foley and Arthur Philip Horkheimer. His father owned a publishing firm and was the mayor of Randolph for 24 years. Foley started his show business career in 1953 at the age of 15 when he hosted a radio show on WBEV. In 1956, he graduated from Campion Jesuit High School. Jack Horkheimer (born Foley Arthur Horkheimer; June 11, 1938 - August 20, 2010) was the executive director of the Miami Space Transit Planetarium. He was best known for his astronomy show Jack Horkheimer: Star Gazer, which started airing on PBS on November 4, 1976. During the summers away from college, he travelled the country playing jazz on the piano and organ under the name "Horky". His agents at the Artists Corporation of America ended up giving him the stage name "Jack Foley". He later changed this to "Jack Foley Horkheimer". He graduated from Purdue University with a bachelor of science degree in 1963 as a distinguished scholar. He moved to Miami, Florida, in 1964 for health reasons and began volunteering at the Miami Science Museum planetarium. He later became its director in 1973. Foley started his astronomy career in 1964, when he was 26, after he moved to Miami and met astronomer Arthur Smith. Smith was the president of the Miami Museum of Science and the chief of the Southern Cross Astronomical Society. Foley started volunteering at the planetarium writing shows and was later offered a position with the museum. Arthur Smith asked Foley to run the Miami Space Transit Planetarium when it opened in 1966. Foley's shows were successful and the planetarium went from losing money to becoming profitable. Foley worked his way up to become the planetarium's educational director and eventually the executive director. Foley changed the planetarium show from a science lecture to a multimedia event including music, lights and narration. He created the Child of the Universe show for the planetarium in 1972, which became famous and used in other planetariums across the country.Sally Jessy Raphael portrayed the voice of the solar system in this show. The show won an international award from the society of European astronomers in 1976. Foley became the executive director of the Miami Space Transit Planetarium in 1973 and stayed there for 35 years until his retirement in 2008. Foley 'Jack' Horkheimer was probably best known for his naked-eye astronomy television show Jack Horkheimer: Star Hustler, which started in 1976 and was broadcast nationally in 1985. Created, produced and written by Foley, the show changed its name to Jack Horkheimer: Star Gazer in 1997 because Internet searches were producing results for the adult magazine Hustler. Foley was known nationally for his commentaries about "astronomical events." He was a science commentator for local Miami news station, starting in 1973. A 1982 viewing event for The Jupiter Effect inadvertently resulted in a nighttime riot due to media coverage beyond Foley's control. In 1986, he helped promote an event for viewing Halley's Comet, traveling towards the equator aboard the supersonic airliner Concorde. He appeared on CNN several times, narrating solar eclipses and even hosted shows on Cartoon Network. Foley was born with a congenital degenerative lung disease known as bronchiectasis and, as a result, suffered from chronic pain. His ailment was not diagnosed until he was 18 years old. During this time, he suffered from radiation sickness and lost his hair as the result of medical X-Ray treatments. In 1957, he had to leave the Honolulu Academy of Fine Arts because it was suspected that he had tuberculosis. His health issues caused him to move to Miami in 1964 for the humid warm climate. I can do little else in my present position. Foley died at his Florida home on the morning of August 20, 2010 at the age of 72. His death was related to the respiratory ailment from which he had suffered since childhood. Foley had never been married and did not have any children. His death was confirmed by his niece, Kathy, and Tony Lima, marketing vice president for the Miami Science Museum, Foley's employer. An email circulated among the museum's staff, stated that they were "very saddened to have just learned that our resident Star Gazer, Jack Horkheimer, passed away today after being ill for quite some time." This article mostly uses material from the Wikipedia page available here. It is released under the Creative Commons Attribution-Share-Alike License 3.0. We've opted to use Foleys first name (as we were taught is respectful) rather than constantly referring to him by his last name. 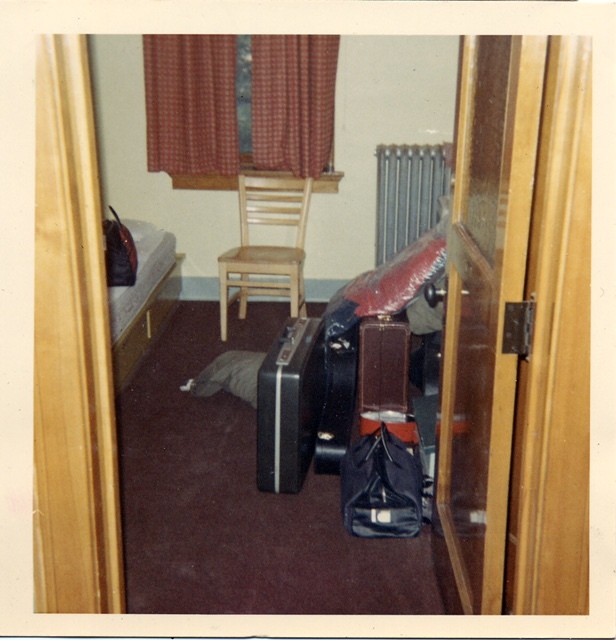 In August (1965) with a year's worth of clothing and supplies packed in suitcases and trunks, boys flocked to Campion Jesuit High School, centrally located 178 miles west of Milwaukee, 240 miles northwest of Chicago, and 200 miles southeast of Minneapolis. Campion was nestled in beautiful Prairie du Chien, Wisconsin, a small town surrounded by verdant bluffs at the confluence of the Mississippi and Wisconsin Rivers, a perfectly peaceful environment for the serious intellectual and character formation of boys. Parents would bring their sons by car, or the boys would arrive easily by Burlington Vista-Dome Zephyr passenger trains, which had a special stop right at the 108-acre campus. The impressive boarding school consisted of buildings both historic--the original Lawler Hall served as a hospital for Civil War veterans--and new--the Hoffman Athletic Center boasted an indoor pool. Upon their arrival the boys were greeted by the large community of 40 Jesuits, dressed in black cassocks, many of whom were assigned to one of several dorms where some of the Jesuits lived in order to be readily available for the students. At this moment in the school's history, Campion was at its high point. The total enrollment of 590 students for 1965 was as impressive as the previous year's all-time school record of 598. 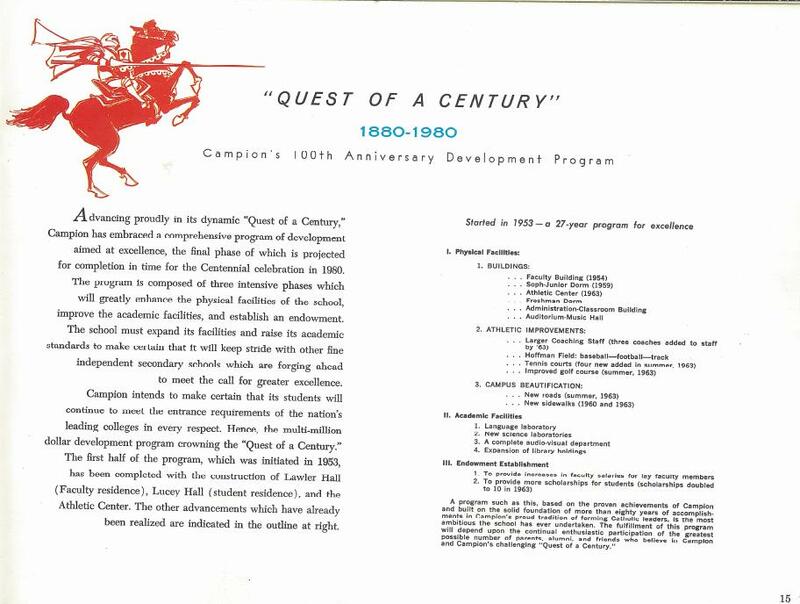 Administrators were enthusiastic as they pondered future grand plans in anticipation of Campion's 1980 centennial celebration. --Casey C. Beaumier, S.J. Changing Visions For Jesuit High Schools In America: The Case Of Campion Jesuit High School, 1965 - 1975. 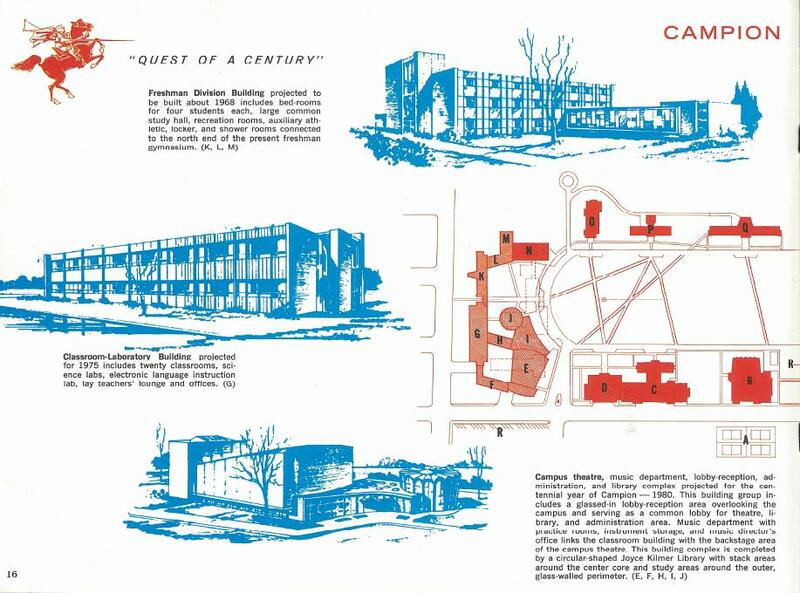 This is a pretty accurate description of Campion when I first visited as a prospective student mid-October 1965, on a warm, hazy Indian summer Saturday morning, with the trees bordering the quadrangle (mostly elms) brilliant in yellow gold, orange and red colors. Ancient Fr. Siebauer gave me the campus tour pointing out the four new campus buildings (Hoffman, Lawler, Lucey, and Xavier Halls) and improvements (notably moving freshmen into Marquette Hall), all the while referring to me as "Sonny". 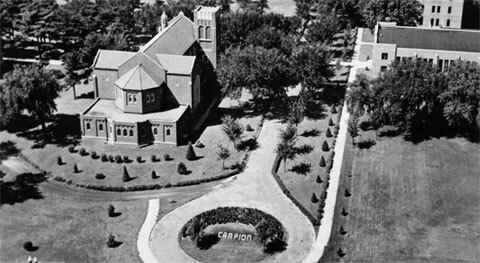 Campion had arrived at this place through its "Quest Of The Century" development program, started in 1953 and, approximately ten years later, the vision of the program to be completed by 1980 (Campion's centennial), certainly appeared grand. 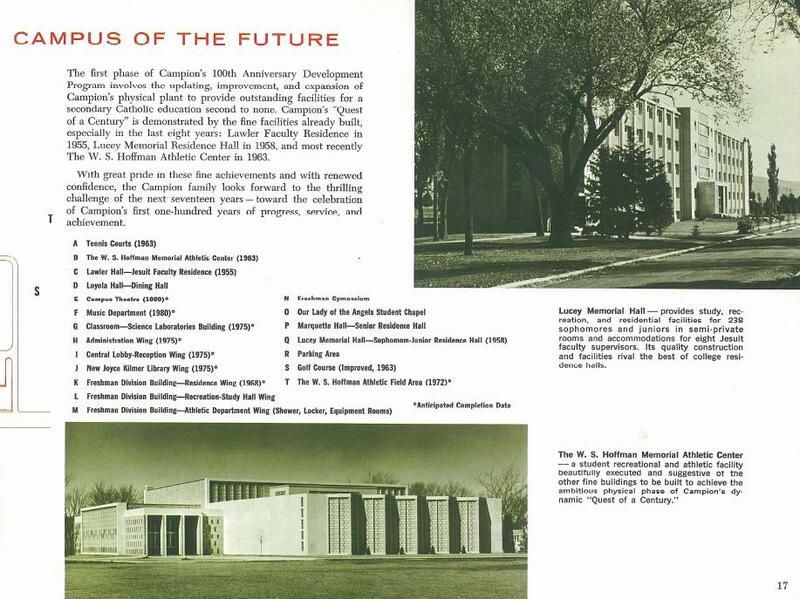 A description of future plans was detailed in the booklet put out for the dedication of the Hoffman Memorial Athletic Center in 1963, the relevant page seen below. By 1980, the entire north end of the campus was to be transformed from 19th century buildings into a modern architectural complex including a new academic building, library, freshman dormitory, campus theater and music center. Evidently, changes to this expansion were occurring as Xavier Hall was completed in 1965, occupying space planned for the "Vision". In reality, little campus construction occurred after Xavier Hall was completed, although plans for renovation of Kostka Hall were in place (according to Bro. Staber) just prior to its loss. The only construction that I can recall was the new campus post office, completed in August 1969, in the basement of Lawler Hall. The phrase "Quest Of The Century" remained on Campion's postage meter stamp used for outgoing correspondence, right up to the letter announcing the school's closure in April 1975. It was the custom at Campion High School for the Concert Band, with the Glee Club, to have a concert on Mothers' Day weekend, toward the end of the spring semester, in even-numbered years. In the odd-numbered years, there were several great dramatic performances by the Masquers. So it was in the spring of 1960 that the school, the band, the glee club, and Prof. deRanitz all prepared for a major concert event. The 1959-60 school year was a year of great adjustment at Campion: For the first time, sophomores and juniors moved into Lucey Hall, and freshmen slept in the dorms on the fourth floor of Campion Hall, in places previously occupied by juniors and sophomores. There was no such change in gymnasiums: Freshmen used the Kostka Hall gymnasium, and upperclassmen used the senior gym, just east of Campion Hall. This concert was scheduled for May 6-7, 1960. It was given in the senior division gymnasium, as the school did not have a suitable auditorium. As soon as basketball season was over, a stage was built at the north end of the gym, as was the custom for these biennial concerts. The original design work on the stage was done by seniors Philip Dixson and Tony Culicchia, who also served as technical producers-directors. The stage manager was Greg Downey, assisted by Norm Mathisen. Faculty supervisors-advisors for the concert included Fr. Edward Hipschen, Fr. Daniel Higgins, and Mr. Roland Teske. Campion's master carpenter, Brother Sylvester Staber, was the faculty supervisor for stage construction. Most of the work for building and finishing the stage was done by students who served as stage technicians, including John Clark, Bob Wilberscheid, Tom Langenfeld, Garry Hewett, John Piel, Ernest DuMouchelle, Bob Grahek, Ed Sullivan, John Freeman, Andrew Bourke, and Jim Armalavage. Many of these students worked long hours giving up their afternoon free time; they also, at times, worked late into the night-still being required to rise at the usual 6:25 a.m. Stage properties and special effects were the responsibility of Patrick O'Hara, who was helped by Walter Eisin, Jim Cowhey, Charles Engelhart, Patrick Holland, Bill Schwarz, and Charles Congo. Audio installations and operations were the responsibility of Bruce Brown, assisted by Vince Chiara and George Silvestri. Electrical work, including lighting, was the responsibility of David Hughes, assisted by Andrew Zinkl, Patrick Connolly, Richard Dannhausen, and John Schulien. John Clark was the band manager and librarian. The production of a spring concert was a matter of great joy and great creativity on the part of the music teacher, Professor Sidney deRanitz. "Prof", as he was called, had been on the Campion faculty since 1939, and remained on the faculty until the school closed in 1975. While the music was the main event, the main purpose of the concert, Prof made sure that a whole lot more was added to the production. There were tableau and dramatic characters on stage while "America" was performed by the combined band, glee club, organ ensemble and soloists: Among these characters were Steve Grange, who played an Eskimo, Mike Reineck, who played a Hawaiian native, and Tom Figge, who played the U.S. Soldier. Junior Bob Lownik was the make-up artist. The program stated "As a picture frame is to a painting, so Pictorialization is to Music." This was carried out by the inclusion of a screen on the stage. Various slides, taken with a popular brand of color film, were displayed while the music was performed. The projectionists were seniors George Elworth and Peter Carey. Three pages of the program are attached, and the slide-projected scenes are described for each piece. For many of the musical numbers, there is a link to a similar performance on YouTube, which will aid in recalling the music. America, which included the Glee Club, the Organ Ensemble, and the various soloists who had performed during the concert. Clark and Rasmussen were student conductors for two of these, and Clark reports that he, and possibly Rasmussen may have filled in as conductor for additional pieces, as Prof deRanitz was not feeling well at the time of the concert. Unfortunately, it is not possible to ask Chuck Rasmussen. One Glee Club member recalls that Fr. Brehm was the conductor for the Finale. Colorado Desparado -- Anonymous, arranged by David W. Brehm, S.J. The Choir and Glee Club was under the direction of Fr. David W. Brehm, who spent five years at Campion (1957-62) as a Religion and English teacher. You can tell from the listings above that songs from musical plays were a particular interest for him. Piano accompaniments for the Glee Club were senior Chuck Rasmussen, and sophomores Ron Kaye, and John Montanus. In setting up the program for this concert, Prof. deRanitz paid particular attention to including, in addition to the band and glee club, individual performances by members of each of the classes. Ave Maria (Schubert) was sung by freshman Ed Konat, accompanied by seniors of the Campion Glee Club. Another Freshman soloist, Bill Schwarz, sang M-O-T-H-E-R, accompanied by sophomore Ken Hoffer. He also performed a tap dance to The Doll Dance, accompanied by freshman accordionist Jim Stanhaus. Freshman pianist Charlie Bauman performed Clair de Lune (Claude Debussy) along with organist, senior Dave Zamierowski. This was an original arrangement for piano and organ, written by Dave Zamierowski. Dave recalls that not every modification he introduced was met with happy agreement by Bauman, but they finally did work things out. There was another small group, composed of sophomores John Montanus on organ, and Ken Hoffer on Piano, plus senior Jim Benso on Tympani: They performed the first movement of The Grieg Concerto. Sophomore Ron Kaye performed two challenging pieces at the piano, El Viejo Castillo Moro (E. Chovarri) and the Fire Dance (deFalla). Another highlight of this concert was the performance by organist-senior Dave Zamierowski, of Zeqinha Abreu's Tico Tico. Sortie Number Ten (Theo. Dubois) and Bach's Fugue in G Minor were performed by senior organist Chuck Rasmussen. Another senior, Bruce Brown, performed Chopin's Nocturne on piano. Senior John Letherman was the Trumpet soloist for Festival Day (P. Thomas), accompanied by the concert band. There was also a clarinet trio, composed of senior Bruce Brown and juniors John Clare and Tom Lardner, that played The Medallion (H. M. Johnson). One of the most memorable performances of this concert was done by a group called The Nomads. It was difficult to trace the performances by a group called The Lucey Hall Four. They sang two Fred Hall arrangements: Ain't It a Shame, and Mam's Li'l Boy. It is reasonable to assume that these were sung by members of the classes of 61 and 62. Freshman Jeffry Dale was called upon to perform an original arrangement of Beethoven's Sonate Pathetique first and final movements, for this concert. As Jeff's career was relatively short, this probably ranked as one of the highlights. One of the featured groups for this concert was the Campion Organ Ensemble. Members were Julius Overbeck, John Overbeck, Chuck Rasmussen, David Zamierowski, James Vavra, and Ken Hoffer. They supported the Concert Band in their performances, filling in for parts that the instrumentation available in the band could not cover. This was a particular duty for Dave Zamierowski. Both Dave and Jim Popjoy recall that the organ music may have been a little too loud, such that it may have overpowered the band. The organ ensemble also performed The Hoosier Holiday (C. F. Foreman) in the later part of this concert. 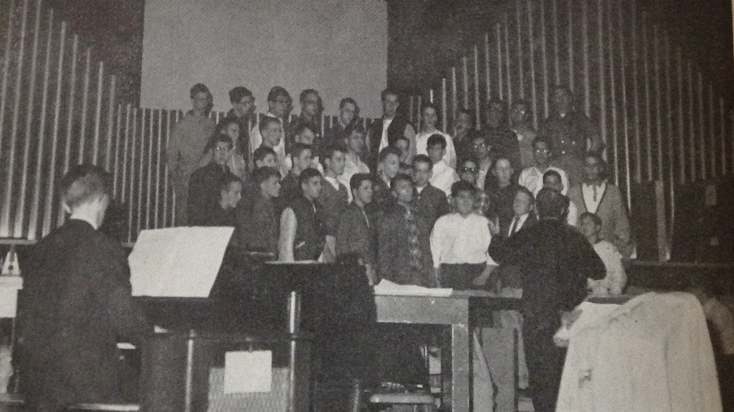 As the 1960 yearbook had already been printed by the day of the concert, there was only minimal coverage (e.g., a rehearsal photo) of the event in that yearbook. 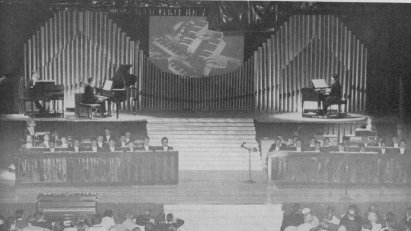 However, the 1961 yearbook included a picture of the stage, showing the location of the pianos and organs, and the concert band. The glee club sang from the steps in the center of the stage, as is shown in the rehearsal photo. The 1961 yearbook stated: "Their execution of difficult classical pieces brought high praise." This was the last full year for Campion with Fr. James B. Corrigan as president. This concert marked a fitting end to a great school year. Afterword: I was a freshman in the year of this concert. As a newly arrived student, I felt great respect for the seniors; they were the leaders of the school and were a large part of the reason that the school was as good as it was. I think several of my classmates felt the same way about the class of 1960. As a Glee Club member, I had a small part in the concert. I was so impressed with the Concert Band that I joined Band during my sophomore year. My interest in music carried forward from that point. The mention in the program of the brand name Kodachrome for the slides that Prof. deRanitz selected to show during the performances surprised me. It was no small chore to fit slides, shown courtesy of World-Wide Film Associates and Pictorializations, Inc., to the music. The mention of the brand name of the film indicated that this name was no small part of American popular culture in the 1950s and 60s, long before it was used to give a title to a poem, released to the public in 1973, that touched on the subjects of educational philosophy and criticism of a high school curriculum. I think the major function of the word Kodachrome in that poem was that it rhymed with "Leave your boy so far from home." In putting this article together, I want to acknowledge the Campion alumni who helped me with information that I was able to include in the article. It was a challenge to find suitable You Tube videos of all the music in the concert. The ones that simply did not fit (even though they were common, well-known songs) were not included in the links. Among the ones I felt were the best were (1) the Kingston Trio singing "The Seine," (2) the band version of "Themes from Offenbach," as performed by the Ada-Borup High School Band and (3) the choral presentation of "Begin the Beguine" as performed by the Hastings College Choir. Let me reiterate my appreciation to all those who worked on this concert and helped in writing this article; The concert had a lasting effect on me, and, I assume, on many others at Campion. 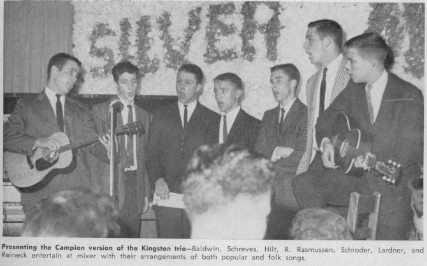 The 1960 Spring Concert at Campion H.S. The Campion Mother's Day concert of 1960 was the end, in several ways. Finals and Graduation were only days away for the seniors. There would be few more classes, band practices, ROTC drills, bed checks, haircuts, morning Masses, JUGs, and dining hall meals before we would pack our gear, load it into a car, train, or plane and be gone from Campion for good. In the days leading up to the concert, music director Professor S. S. DeRanitz led band practices at Music Hall with his usual enthusiasm. Those of us performing solos or duets worked keyboards and pedals (piano or organ) in practice rooms and at rehearsals. I barely recall it all now, 58 years later. I believe I was looking ahead more than cherishing our last days at Campion. It had become clear that music was not to be my career. I ended piano lessons earlier that year. Nevertheless, "Prof" encouraged me to prepare something for the concert. I agreed to play the Chopin Nocturne in Eb minor, which I liked and performed pretty well. I also offered to play another tune, Ernesto Lecuona's Malaguena, which I had played for several years (which probably did not get listed on the program). I recall that after the concert, Fr. Milman remarked that my performance seemed to be loud banging. I was a "so-so" clarinet player in marching and concert bands -- never highly motivated but reasonably competent. When underclassman Tom Lardner joined the band as a transfer student, I learned what it meant to be a clarinet player. Tom seemed good at everything he undertook, and I was glad that he and John Clare took the lead for the clarinet trio. Audio for the concert was a public address system involving only one or two mics, an amplifier, and speakers, much simpler than the sound boards and mixer systems in use today. Electronics was my passion back then, so that set up was easy and enjoyable with friends Vince Chiara and George Silvestri to help. By the date of the concert I had been accepted to college and was looking forward to a new life far away from Prairie du Chien. I can almost feel, even now, the pressure to study hard for finals, the anticipation of a summer farm job at home in southern Wisconsin and then setting off in August to Xavier University (Cincinnati, OH). I now see that the spring concert was the end of my childhood. After that concert I no longer considered becoming a piano performer or electronics engineer. My clarinet went with me to college band and helped pay the bills, but never tempted me to study music. However, my interests did not die but went dormant. Years later they re-emerged, but that's another story.